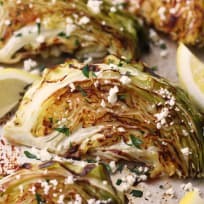 Roasted cabbage wedges with lemon and feta cheese are pure veggie heaven. It’s the perfect low carb side dish for any meal. 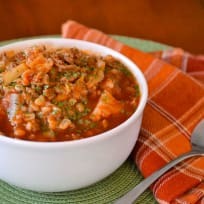 This Instant Pot Cabbage Soup takes only 15 minutes to throw together before you let your electric pressure cooker do the heavy lifting. It is full of hearty vegetables and is pure comfort food in a bowl. 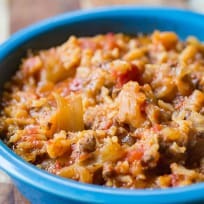 Similar to stuffed cabbage rolls, in soup form! Corned beef and cabbage is everyone’s favorite meal from across the Atlantic. 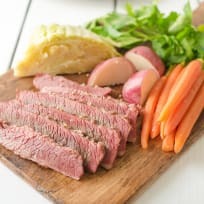 Beef brisket is brined in spices and many flavorings then cooked with carrots, onions and cabbage. This Rock & Roll Burger starts with an all-beef patty and tangy BBQ sauce. Add bacon, cheddar cheese, and a spicy slaw to complete this outrageously good burger. It’s a little bit of everything, just like Rock & Roll! Bubble and squeak uses up your leftover mashed potatoes for an awesomely delicious potato cake. You’ll be making extra mashed potatoes, for sure! Chow mein noodles with chicken is an easy recipe to get dinner on the table in minutes. So much better than take out in the same amount of time.